The Wall Street Journal has dubbed Brazil as “The Social Media Capital of the Universe” due to the country’s record breaking social media usage. Brazilian citizens are naturally very connected and as the middle class expands, more people are going online and turning to social media. According to social analytics company Socialbakers, Facebook has some 65 million users in Brazil, making it by number of users the social media giant’s second largest market after the United States. An estimated 46 million Brazilians have home Internet access, with an impressive 97 percent using social media. Brazil’s hyper-social users especially like to chat, almost constantly, about TV shows, sports and the news. Although broadband use is still sparse and expensive, mobile phones provide a much cheaper way for Brazilians to stay connected. Given the lack of diversity in mainstream media, social media has become a popular alternative for keeping up with the news and latest trends. In addition, World Cup organizers have vowed to provide free high-speed Wi-Fi throughout all 12 of the World Cup venues, which will likely increase social media usage within the venues themselves. During large social movements such as the Arab Spring and revolution in Ukraine, popular social media sites such as Facebook and Twitter were used to communicate initial protest locations due to their ability to reach a maximum amount of viewers. However, concerns over suspected government monitoring have moved activists to utilize other platforms to disseminate more specific information, including push-to-talk messaging services like Zello, Voxer, and TiKL. The push-to-talk messaging service Zello allows individuals to communicate to one another walkie-talkie style via a simple broadband connection. The app interface looks like a button on a phone which when pressed enables users to speak to people on a particular channel. The channels can be as small as two people or as big as hundreds of thousands. In fact, the largest Zello channel in Venezuela is approximately 450,000, but only 600 individuals can be active on a channel at one time. 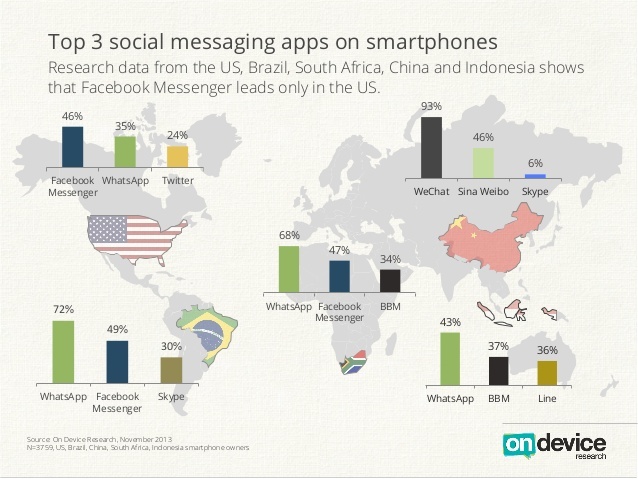 The most popular mobile messaging app in Brazil is the recent Facebook acquisition Whatsapp, with more than 45 million active users and a 72 percent market share. The growth of Whatsapp in Brazil is so large that in April 2014, company CEO Jan Koum stated “the message growth rate in Brazil — it’s not like a hockey stick, it’s like a vertical line.” The cross-platform instant messaging subscription service for smartphones uses the Internet for communication and thus does not send messages by the more generally used SMS (Short Message Service). In addition to text messaging, users can send each other images, video and audio media messages, as well as their location, using integrated mapping features. Social media in Brazil has also enabled the phenomena of “Rolezinho” or “little outings.” These occur when a flash mob of youth, often from poor neighborhoods, converge on a location or event such as a shopping mall or public building and disrupt normal activities such as shopping, traffic flow, or public access. If you have a vested interest in the World Cup or Brazil, we invite you to download a copy of the full report.